Content strategists today have quite a challenging role. In fact, it is not even a role that is easily defined. Ask five different companies what their content strategist does and they will all give you five different answers. Nevertheless, content strategy is a crucial part of a broader digital marketing scheme that brands must employ in order to be successful. While often lumped together, content strategy is not the same thing as content marketing. This distinction is important, as both concepts work together, but have distinct roles. 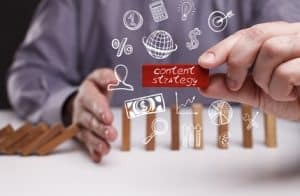 Ultimately, a solid content strategy will be the driving force behind your content marketing and online engagement efforts. We regularly work with clients, helping them craft solid content strategies which build a solid foundation for all of the content that is produced and subsequently shared. Unfortunately, not every business is even aware of the need for a well-developed strategy. According to Content Marketing Institute, nearly 70 percent of B2B businesses are actively creating more content, which is definitely a good thing. However, less than 30 percent of those same businesses have an actual strategy in place for how that content is presented. If this is where you’re at right now, let us consider the importance of a good content strategy. First of All: What is Content Strategy? Before diving into the benefits of a good content strategy, it might help to first define the concept. We apply the definition set by Kristina Halvorson and Melissa Rach in their book Content Strategy For the Web. As they put it, “Content strategy guides your plans for the creation, delivery, and governance of content.” Without this crucial step, you may find yourself creating content just for the sake of having it. Considering how much time content creation can take, it is in your best interest to develop a solid strategy that will not only line up with your broader marketing and business goals, but that will also ensure each piece of content you decide to create is in fact, worth creating. -Kristina Halvorson and Melissa Rach, Content Strategy For the Web. Now that you’ve got a better understanding of what content strategy is, let’s discuss the importance of it, including the reasons why brands should even be creating content in the first place. Defining the message you are presenting online. Eliminating unintended confusion and providing clarity across all platforms. 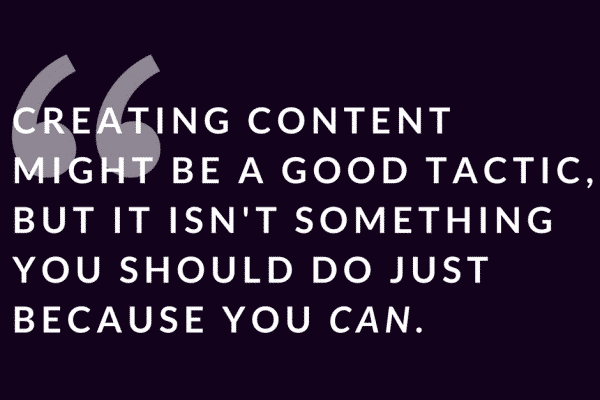 Reducing the risk of producing content not likely to resonate with your intended audience. Simply delivering content without a reason obscures your message and often fails to establish trust with your followers or visitors. A solid content strategy helps deliver content that will give your brand personality and a purpose. It’s also what often convinces someone to choose your business over a competitor offering the same thing. Part of this process involves analyzing results you’re getting from your content by diving into your available stats from sources like Google Analytics and making the necessary adjustments based on those results. Determining what information browsers are actually seeking from you. Factoring in how your desired audience prefers to access your content online. Setting a regular schedule for when content posts or presents to retain interest. What you’re posting online or displaying on your website isn’t as important as the reason why you’re presenting such content. The occasional struggles you face to create content will become less of an issue once you know what’s inspiring you to produce it. In fact, it is surprising how much easier it becomes to produce useful and beneficial content once you have a solid strategy in place. Graph courtesy of Buzzsumo. 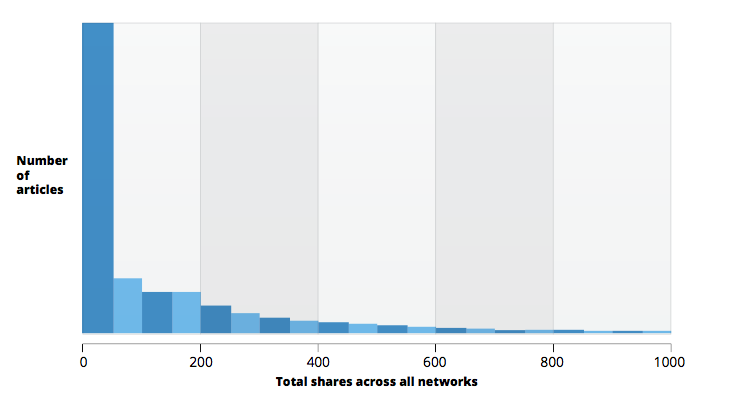 Surprisingly, over half of all content gets 8 shares or less. Minimizing risk by offering free estimates or allowing users to click to receive more information before committing. Presenting a convenient mobile app to make it easier to make choices on-the-go. Strategically placing a call-to-action within content at a point when visitors will likely have enough information to make a decision. In addition to these strategies, we also provide specific conversion rate optimization (CRO) services. Content strategy is what drives repeat business. Loyalty programs involving emails sent directly to inboxes with customized deals and offers are a common example of a strategy that’s often effective. Focusing on loyalty rather than just getting the sale often results in satisfied customers likely to spread the word about your business online. It’s this positive digital word-of-mouth that builds your reputation and expands your online reach. Sales funnel courtesy of Business. 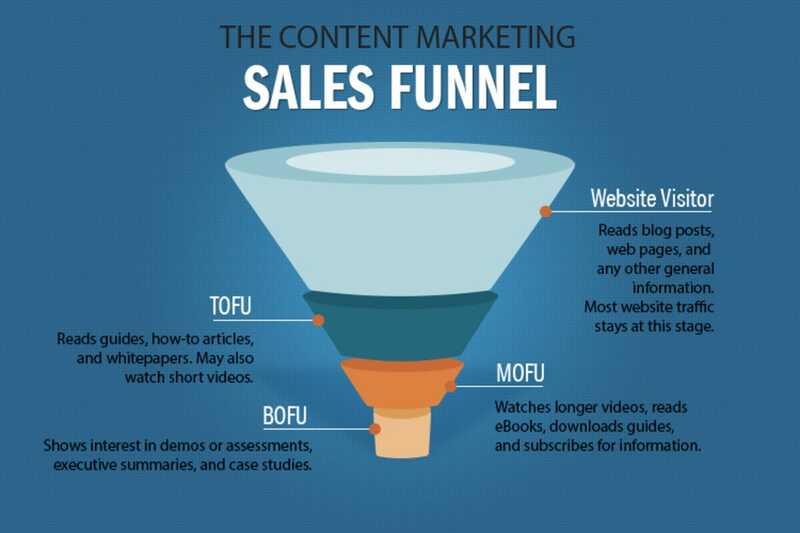 Your audience can enter your sales funnel at any point- do you have content that speaks to each section? Creating initial awareness at the top of the sales funnel. Providing reasons why customers should make their intended purchase from a certain business in the middle of the sales funnel. Showcasing content that appeals to customers ready to make a purchase at the bottom of the sales funnel. How Should You Create Your Content Strategy? Creating a content strategy is by no means easy, but it is worth your energy to develop something that will help you stay on track and in line with your overall business goals. In fact, Halvorson and Rach go so far as to say that content is worthless if it doesn’t either support a key business objective or fulfil a user’s needs (or both). 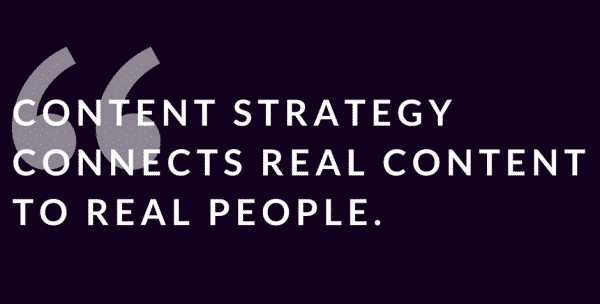 Good content strategy helps ensure your content is pleasing both parties. There are four main concepts that make up your content strategy and they comprise what is known as “the quad.” If you consider each of these components, you will have content that will satisfy both you and your users. The four components further divide into two sections, content components and people components. Content components encompass content itself, and people components involve the creation and management of the content. Substance: Fairly self explanatory, this is the content itself. Here you will decide what content you need- including the type of content and what message it needs to send. Structure: This involves how the content is displayed and formatted, as well as how you will organize it all. Workflow: This is part of the ‘people’ component and deals with who exactly is in charge of creating the content, as well as what tools to use as well. Who is in charge of ‘launching’ the content and also monitoring it and maintaining it once it is published? Governance: Finally, governance details who is in charge of making decisions regarding content as well as content strategy. 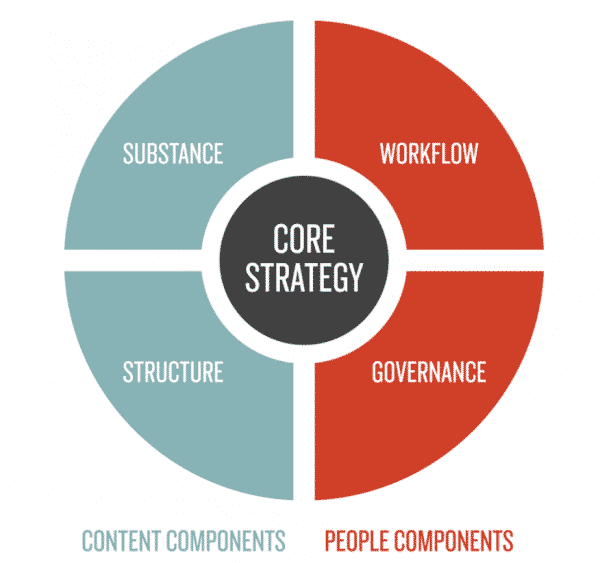 Combined together, these form the core of your content strategy. Not only are you making decisions about content itself, but you are also determining who is in charge of the content. Consider both of these aspects when developing your content strategy. With a clear content strategy, you are better equipped to create meaningful content. Use your strategy to analyze existing pieces of content to determine if they are effective and support your business objectives. A good content strategy lays the groundwork for you to create content that is useful to your users, serves your business goals, encompasses users at all points of the sales funnel, furthers your brand image, boosts conversions, and more. Need help with your strategy? Webdirexion is at your service. Whether you’re just getting started or looking to boost your ROI with your online engagement efforts, we’ll put together a strategy tailored to your needs, goals, and available budget. 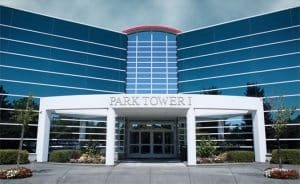 Contact us today to learn more about our services. 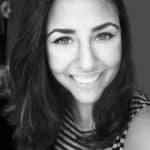 Briana is our content maven at Webdirexion bringing writing, editing, SEO, and social media skills to the team. She graduated from the University of Georgia with a B.A. in Communication Studies and has served as an "Ambassador for Global Awareness" a volunteer assignment to promote civil rights and social action.At Webdirexion she is helping with writing, editing, quality checks, and learning page layout and split testing using the Divi WordPress theme.